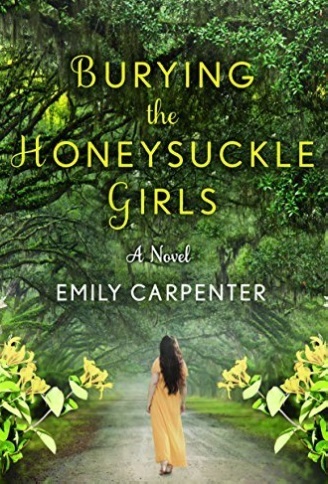 Emily Carpenter is the bestselling author of two psychological thrillers, Burying the Honeysuckle Girls and The Weight of Lies, which comes out on June 6. After graduating from Auburn University with a Bachelor of Arts in Speech Communication, she moved to New York City, where she worked as an actor, producer, screenwriter, and behind-the-scenes soap opera assistant for the CBS shows “As the World Turns” and “Guiding Light." Born and raised in Birmingham, Alabama, she now lives in Atlanta, Georgia with her family. I push hard, and I don’t give up easily – not on projects, dreams, or people I love. I’m persistent to a fault. I believe in myself, even when nobody else does and long past it is really reasonable to do so. I am unfailingly optimistic. I hold fast to the belief (the delusion?) that my own art is worth putting out into the public sphere. I don’t think I’d dare to do it otherwise. I have this quality of being completely uninterested in activities and hobbies the majority of most typical people around me partake in. It is something that has, at times, made me feel odd and alone, while at others, delightfully and wholly myself. For instance, I have a whole section of my brain that is completely free of sports-related concerns. Most people around where I grew up and currently live in the South have a dedicated football section of their brain, for me, that particular region in my brain is a vast, open, available wilderness. A whole lot of free, unused real estate. So while 99% of the population around me is talking and debating and cheering college football, I remain blissfully unaware and emotionally unaffected, with lots and lots of free time to think about and write my books. This is just a theory of why I’m the best. I don’t think there’s any way to prove this. My highest aspiration is to facilitate my three children’s success. And by success, I mean love, fulfillment, and responsible living. Professionally, I’d like to garner a loyal readership who always anticipates my next book in an ongoing, never-ending cycle! And maybe have a movie made of one of my books. Yeah, that would be fun. Being married 29 years to my husband – because we are both…not easy, as they say. It’s too private to share. But I will say that – in that moment of decision – I was amazed to find how strong I was. It was like a flash, suddenly realizing the value of what I brought to the world as a person and how I’d been discounting that my whole life. It was a moment where I was no longer anyone’s daughter or wife or mother – I was just myself, Emily. And I knew that it was enough to be me alone. I didn’t know making this decision was going to reveal this to me, but it did and what a life-changer. My mottos are not so much quotes as they are vague feelings. Like, I go through life with a vague feeling that God is there, that love matters most of all and that good will ultimately win. I don’t have any proof, just this hunch that these things are true. I think they call that faith. At any rate, it keeps me going. My favorite people are my husband and boys (I have three), my sister, my niece. My husband and I meet with two other couples for dinner regularly. I love those guys, even though we have our political and religious differences. I also have a critique group, a small group of writers I’ve known for many years now. We share our war stories from the publishing world and hanging out with them is always fun. Professionally, I’m in the process of figuring out who I really admire and look up to. I’m searching for those role model-type people now – observing how successful, working writers structure their lives and work and conduct themselves out in the world and on social media. I haven’t really honed in on anyone yet. Lake Martin in Alabama is the most peaceful place on earth. The lake is deep and cool, but the weather’s hot as deep-fried hell. You have to have a hearty Southern constitution to deal with it. Paperback books, midcentury modern chairs and tables, unreasonably expensive purses, Givenchy perfume, Sharpie extra-fine pens, my MacBook Air, tiny wine glasses I find at tag sales, my 1950s Globe Wernicke Tanker desk, any photograph my niece takes, giant TVs, and Netflix. Trees, particular the American Chestnut. I’m researching a new book that involves the blight that wiped them all out in 1914. I’m currently obsessing (like the rest of the world) over The Handmaid’s Tale on Netflix. My son is going off to college soon in the Pacific Northwest, so I’ve gotten really interested in life out there. Politics has become a passion, too – possibly more of what you’d call a burden – lately.